FOOD | This may sound weird, but I love ice cream so much that I actually avoid buying it because my self-control is the worst. Yet ever since discovering HALO TOP brand ice cream a few months ago, I have been eating and enjoying this low-calorie treat a pint at a time, and as often as I can. For those not on the Halo Top bandwagon: Each of its 17 glorious flavors, packed inside its signature gold-rimmed carton, are between 240 and 360 calories per pint. (Other brands are about four times the calories, per half-cup serving.) The best part? It actually tastes good! And you can eat a whole pint without feeling like a horrible glutton! The secret to Halo Top's taste comes from natural alternative sweeteners, like erythritol, a form of sugar alcohol, and stevia. With flavors that range from basic vanilla bean to birthday cake, chocolate mocha chip, red velvet, oatmeal cookie and peanut butter cup — along with seven new flavor combos debuting later this month — there's a pint of Halo Top for every sweet tooth out there. BOOK | You know that feeling when you read a book so good you can't stop thinking about it or pleading with your bookworm friends to read it? 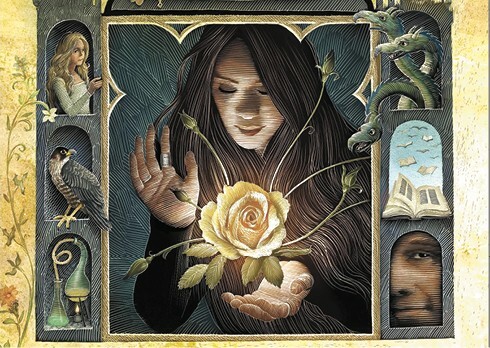 UPROOTED, a 2015 title by bestselling fantasy author Naomi Novik, is one of those books. A fairy-tale-like story about a young woman learning to hone her magical capabilities under the scrutinous eye of her seriously uptight mentor, a mage called The Dragon, Uprooted was a finalist for the Hugo Award, and won the Nebula Award for best novel — both are major accolades in the genre. Set in a time and place inspired by European folklore, Uprooted's protagonists must test the limits of their individual powers as they become the only hope to stop the encroaching Wood, a sentient, evil forest that threatens to destroy their world. With threads that are comfortably familiar to fans of the fantasy genre (the book has even been compared to the literary classic Jane Eyre), Uprooted manages to stay true to its genre roots (no pun intended) while simultaneously presenting a fresh and mesmerizing new realm of magical storytelling.